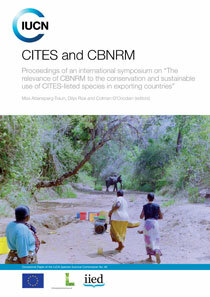 Proceedings of an international symposium on "The relevance of CBNRM to the conservation and sustainable use of CITES-listed species in exporting countries"
This output from a symposium on community-based natural resource management (CBNRM) for the conservation of CITES-listed species aims to provide the necessary knowledge base for broad policy discussions within the European Union on the relevance of local conservation programmes for CITES to achieve the goals as set out in its current Strategic Vision 2008-2013 (Res. Conf. 14.2). Case studies from Africa, Central Asia and South America, address a range of issues including characteristics of successful CBNRM programmes; income generation and conservation implications of CITES species listings for CBNRM; impacts of trade restrictions; and the relevance to CBNRM of international biodiversity goals, policies and initiatives. The symposium conclusions should be helpful in identifying options to enhance CITES Strategic Vision post-2013.